- Contactless cards and cashless societies - What's in store for cash? Contactless cards and cashless societies – What’s in store for cash? Is your business prepared for the rise of the cashless society? Expert Market’s latest analysis into the future of UK payments has revealed that over a third of people think cash will become obsolete in the next 25 years. We surveyed over 1,600 people to gauge the public’s feeling towards cash, cards, mobile payments and everything in between. The results were extraordinary. Our survey clearly showed that millennials (here defined as those aged between 21 and 36), are slowly but surely veering away from cash. Payment with contactless, mobile payments and apps is on the rise. 33% of millennials avoid using cash altogether, with 1 in 5 carrying less than £5 cash in their purse or wallet. Equally, 41% of millennials prefer to pay friends back by apps than with cash. A mammoth 46% of this age group are put off from buying from a cash only business. And 68% have been frustrated at not being able to part with their money at a cash only store. Can you afford to be turning away over two thirds of this generation’s custom? Nowhere is this cash-phobic attitude more obvious than in the finding that 24% of millennials have thrown cash in the bin on purpose! Cash is clearly no longer valued by millennials. But what about the older generations? Turns out it’s not just millennials who have moved away from cash in recent years. Our survey showed that 34% of generation X (age 37-52) and 34% of baby boomers (age 53-69) thought cash would become obsolete in the next 25 years. According to the UK public, the days of slot machines, games arcades and cash only businesses are numbered! Scary stuff. If you’re wondering what you can do to keep up with the times, read on! Still in the dark as to what a cashless society involves? Let’s crunch the key questions. Contactless payments are small value card purchases (up to £30) that are made without the need to enter a PIN. Contactless payment systems are of enormous benefit if you’re selling small value items in volume or are in the hospitality trade. They’re much faster to process than conventional chip and PIN. Contactless is faster and easier than cash and there are less errors and opportunities for fraud – probably why a third of millennials are avoiding cash altogether! Almost every bank in the UK now issues contactless cards. They can be requested by a card user or will usually be automatically provided when a card is replaced. The rise of contactless payments was boosted by McDonalds and other large brands adopting the technology. Currently in the UK we spend a whopping £250 million a month on around 32 million contactless payments. Given the meteroic rise of contactless since its introduction in 2007, it’s no surprise that 34% of people think it will be obsolete in 25 years. Contactless cards are basically as secure as chip and pin cards. Typical losses due to fraud are 1p in £100; more or less the same as chip and PIN. Card issuers will make good any fraudulent losses as long as reasonable precautions and care have been taken. And contactless cards that use biometric data such as finger vein detectors for verification are being trialled. Currently there is a £30 limit on transactions, though there’s no limit to the actual amount your customers can spend with contactless. It’s so easy that almost half of millennials will be put off from your business if you won’t take their cards. Ouch. Want to start taking contactless payments? What can a PDQ do for you? Cash payments in decline and pennies are ending up in the dustbin. So how can your small business equip itself for the rise of the cashless society? Well, it depends on the kind of business you’re running. If you want to take payments online, you’ll need to set up a payment gateway. Or if your business relies on taking payments over the phone or via mail order, look into what a virtual terminal can offer your business. If your business trades face to face, you’ll need a PDQ machine to take contactless payments from your store. The good news is this is easy to get set up. The better news is that we’ve listed some of the most popular PDQ machines on the market for you below. And the best news? You can dive right in and start comparing quotes from top merchant account providers here. It is estimated that there are over half a million contactless terminals in the UK. 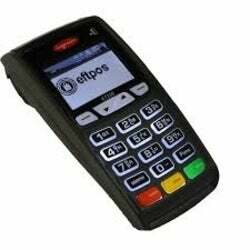 Most modern chip and PIN machines incorporate a contactless payment facility and every merchant account provider in the UK can supply merchants with these terminals including countertop, portable and mobile models. Smartphones enabled with payment processing apps like iZettle or Square can also now accept contactless payments. 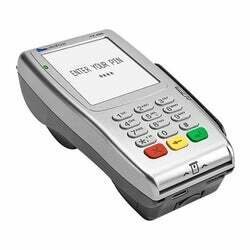 This countertop terminal integrates chip and PIN and contactless payments and includes the latest PCI PED 2.0 security system. It also has Bluetooth connectivity and can be used as a portable terminal. 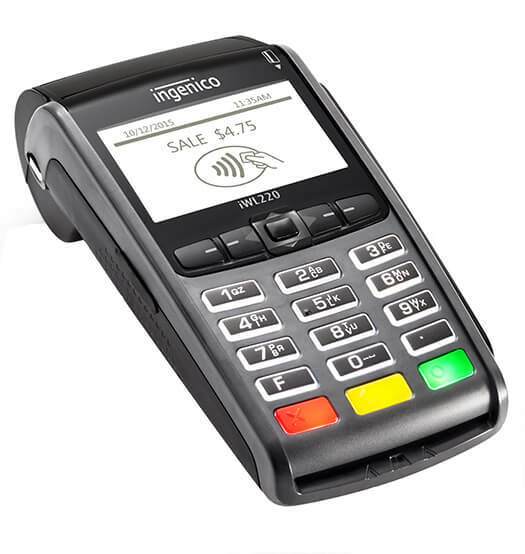 The Ingenico iWL250 contactless and chip and PIN terminal incorporates Bluetooth technology to connect to a base station and GPRS communication with a roaming SIM that lets you take payments anywhere there is an available mobile network. 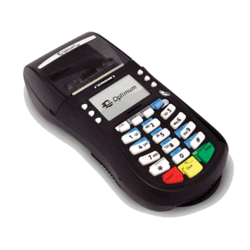 The Hypercom T4220 is a solid countertop terminal with integrated contactless card reader. It’s a cost-effective solution, especially if you’re a smaller merchant. It comes with a high degree of security, and the terminal can be locked to the supporting pole for additional protection. The Verifone VX 680 is a small handheld portable terminal that’s perfect if you’re in the hospitality industry. Its powerful in-built processor makes payments quick and easy, so you won’t have to keep your customers waiting. And its vibrant colour touch screen adds a dash of style. It incorporates Bluetooth, Wi-Fi and GPRS connectivity. Accepting contactless payments is more than a great way to save time taking payments or to give your business a boost. It’s an absolutely crucial way to stay with the times and make sure your business stays ahead of the competition. If you’re serious about growing your business, you won’t think twice about cashing in on what a merchant account can do for your business. Got a minute? Pop some details into our short form and start comparing quotes from top merchant account providers today.